Comment: Hardcover The item is fairly worn but still readable. Signs of wear include aesthetic issues such as scratches, worn covers, damaged binding. The item may have identifying markings on it or show other signs of previous use. May have page creases, creased spine, bent cover or markings inside. Packed with care, shipped promptly. There are many ways to try to improve our lives - we can turn to the wisdom of philosophers, the teachings of religions or the latest experiments of psychologists. But we rarely to look to history for inspiration - and when we do it can be surprisingly powerful. Showing the lessons that can be learned from the past, cultural historian Roman Krznaric explores twelve universal topics, from work and love to money and creativity, and reveals the wisdom that we've been missing. There is much to be learned from Ancient Greece on relationships, from the industrial revolution on job satisfaction, and from Ming-dynasty China on bringing up our children. Just as a Renaissance 'Wunderkammer' was a curiosity cabinet full of fascinating objects, each with a story behind it, "The Wonderbox" is full of stories and ideas from history, each of which sheds invaluable light on the decisions we make every day, whether we think about the different uses of the senses or changing attitudes to time. 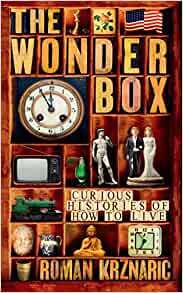 History is usually read for pleasure or for insight into current affairs, but "The Wonderbox", stepping into the territory of Alain de Botton and Theodore Zeldin, is 'practical history' - using the past to think about our day to day lives. 3.0 out of 5 starsGreat idea lost in his own ego. I bought this on a local newspaper review and was really looking forward to it. I am 20% of the way through and I am ready to put it to one side or use it as a reference book. The examples he uses are excellent and meaningful, his scholarship and the structure of the book is fine. My problem is basically with him. I do not want or need his philosophy permeating all aspects of this book or, more correctly making assumptions about the rightness or wrongness of his readers. The historical references are strong enough on their own and do not need a post modern take on them. Far better to lay out the instructions from history and let readers take their own course rather than his ham fisted way to lead them with his own modern view of the world. I would not mind if his philosophy was sophisticated but it is nothing more than you can read anywhere on a left wing blog or a social democrats web page. Lacking depth, yet with an idea of his own right view, is what lets this very fine idea for a book down. It reminds of an annoying habit with reporters which I dislike, "This morning my wife said to me blah! blah! blah!". At times I feel a bit like this with this author. What the author manages to do very well in this book is to raise deeply important messages and discuss them in a very rich, yet very accessible manner. This is very fitting for our time. Our minds are overloaded by information and stimuli of mostly dubious value. This book strives for and achives the opposite: its enormous value is rendered in a succint prose, which is both warm and personal, and full of inspiring and instigating energy. Make no mistake: the message here is as important as is simple, because it touches us in a very direct yet profound way. I suggest you read first the section on "Belief", then put the book down for a day in order to absrb that one specific message. Let it resonate in your consciousness with unrestricted selff-honesty. That will sure move something deep inside your mind, and your very notion of being. Then move on to the rest of the book and let the author's clear-minded, mature, empathic, and passionate prose travel freely in every realm of your existence and change your life. For the wisdom expounded in the book is transformational, in that it can set you free from the many virtual shackles our age. If you want to (re)claim freedom and (re)set yourself on a path of practical wisdom and liberating happiness, you should absolutely read this book and recommend it to your dear ones. 5.0 out of 5 starsRecommended with a thankful smile. Amazing read - couldn't put it down - about insights into a happy, rewarding, and meaningful life gleaned from historical figures and an understanding of changes (or not) throughout history. Lively and well-researched at the same time, it reads like an intelligent, well-considered, and thoughtful adult bedtime story. Reading for a course. Kind of circuitous in topics and a bity obtuse. That is all I have to say. Secular society has failed to provide us with a guide on how to live. As Krznaric suggests, the self-help literature and the psychology of happiness seem unsatisfactory and superficial. His approach, which seems so obvious and compelling once embarked upon, is to seek guidance from history. This beautiful book draws inspiration from how those before us have made sense of the things that matter most to us: love, family, empathy, work, time, money, creativity, belief, and death. Krznaric effortlessly draws on the vast richness of how people have lived in the past. We discover that despite our many forms of progress, often those before us had far deeper conceptions of how to live. Love has a far more subtle and varied form in Confucian, Buddhist and ancient Greek thought. Time, "the tyranny of the clock" which Krznaric describes, has not always been our master. Rushing to achieve more we often succeed only in experiencing and understanding less. There are wonderful alternatives, such as the Balinese concepts of "full days" and "empty days". Nothing in this book is predictable, or dull. Intriguingly, family conversation is something we have struggled with as much in the past as the present. But the ways in which we have failed, and the examples of cultures that succeed, can provide guidance. The range of sources and relevance of this book is impressive. But Krznaric keeps his erudition hidden; his wisdom comes to the fore. This book is not just a guide on how to live. Reading this book is an end in itself. It is a deep, moving, pleasure. 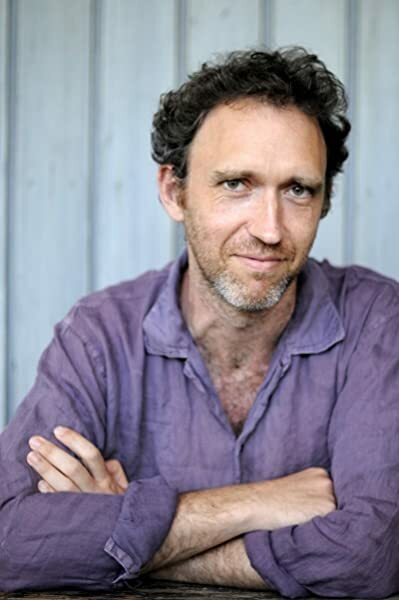 I had the chance to hear Roman Krznaric speak at the Wilderness Festival in 2012 and because of that, bought his book The Wonderbox. I thoroughly enjoyed it. Mr. Krznaric writes about love, friendship and community (and many other subjects) with a sense of introspection and excitement at the possibilities of how they could be defined in a more fulfilling way. The lovely thing is, that he does it using history as context. It was quite an interesting, uplifting read - I have passed my copy on to family and friends and think it will stay on our library shelves indefinitely. A nice romp into the lives of extraordinary people. 5.0 out of 5 starsI loved this book! Its a gem. insight, such great stories. Inspiring, questioning and relevant. I just hope more people read it and absorb some of the things he discusses. way that I know I am going to enjoy it just as much, if not more, on my second visit. Thank-you Roman, for your inspired book.